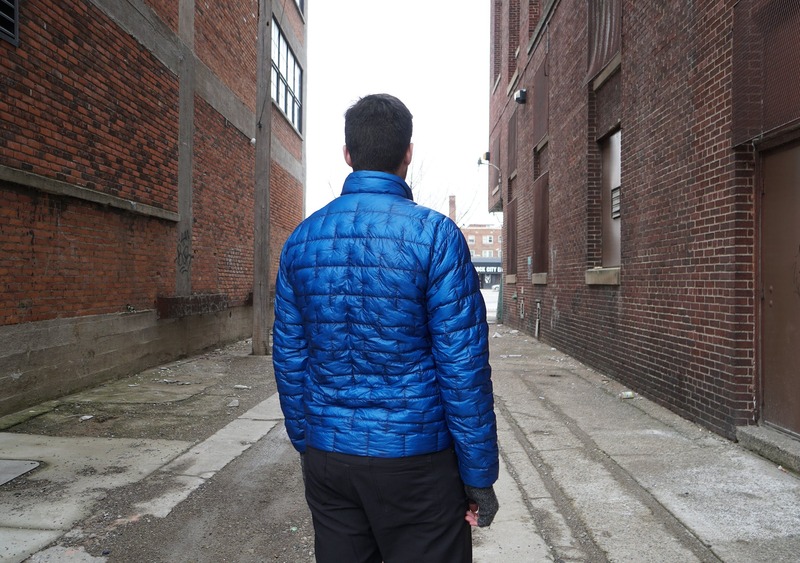 The Plasma 1000 is your classic “puffy” down jacket. It’s super warm, super light, super compressible, and super great for travel—what’s not to like? And while these types of jackets may have historically been associated with hiking and camping, they are becoming more and more common in both everyday life and the urban travel scene. We’d even go as far as to say they have become quite “trendy.” Yeah, we do fashion stuff. Anyway, enough chit-chat. Let’s dive into this review to see if the Plasma 1000 can compete with some of the other down and synthetic down jackets on the market today. Okay, before we get into all the nitty-gritty we have to make one thing abundantly clear. THIS THING IS SO FREAKIN’ LIGHT! Seriously, it practically floats in mid-air. We’ve got the medium size and it comes in at just 4.8 ounces. That’s about half the weight of the Patagonia Micro Puff, which we thought was the lightest jacket in the history of jackets. Boy, were we wrong. To give you even more context, it’s lighter than the iPhone XR (6.84 ounces) and almost three times lighter than the MEC Uplink Jacket (12.3 ounces). 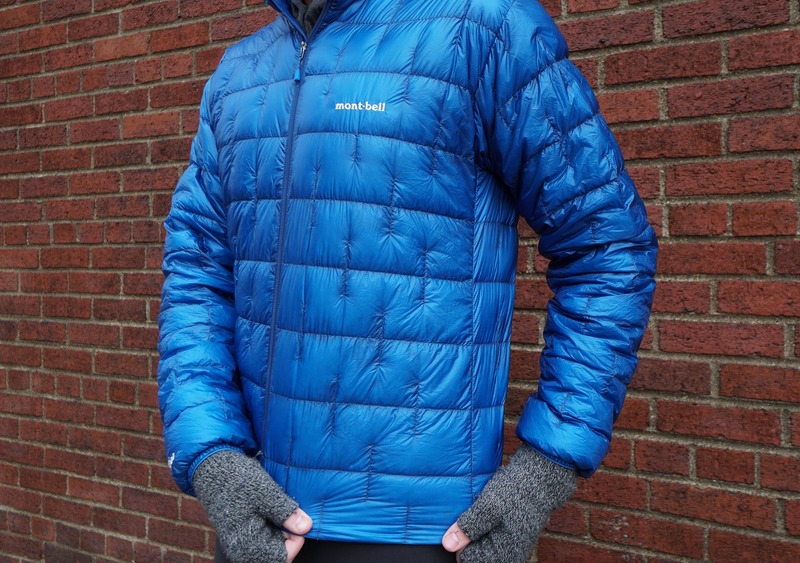 This is truly one of the lightest down jackets on the market, and the best part is that we really don’t feel like they’ve sacrificed much warmth in achieving that. At the time of this review, the Montbell Plasma jacket is available in three different colors: primary blue, black, and garnet (red). We’re not sure why the colors aren’t primary garnet or secondary blue or tertiary black, but oh well. Just know that the blue is in fact primary. Whatever that means. From a branding perspective, you’re only going to find one Montbell logo situated on the front of the jacket. Overall, we like the look of this jacket. Normally, we’d go for a black jacket because we love black and it’s a bit more subdued for urban travel, but we decided to go out on a limb here. And we’ve got to say—this blue has been striking our fancy. It’s a nice change! In what seems to be a somewhat common trend with our Instagram Aesthetic polls, this one came in at a rock-solid 50/50. It seems safe to say that you’re either going to like this jacket or you’re not going to like it. Crazy how that works, isn’t it? The 7D nylon fabric is Montbell’s “Ballistic Airlight Nylon.” According to their website, they use a highly technical production process to create extremely fine, super thin threads which are then woven into ultralight gossamer fabrics that share the same characteristics as ballistic nylon. The difference is that this stuff is 1.5x more abrasion resistant than other similar weight fabrics and it boasts 3x the tear strength of nylons that are almost 20% heavier. We haven’t exactly confirmed or tested the tensile strength of this material compared to others—mainly because we’re not super stoked on ripping our gear apart—but in our two months of durability testing to date, it’s held up well and there aren’t a lot of aesthetic dings or holes forming across the jacket. If you’re looking for the Reader’s Digest version of that, just know that this material is very thin and extremely lightweight, but it’s still quite durable and resistant to tears considering the weight. And compared to the fabrics we’ve seen on similar down jackets, we think this fabric is better than most. 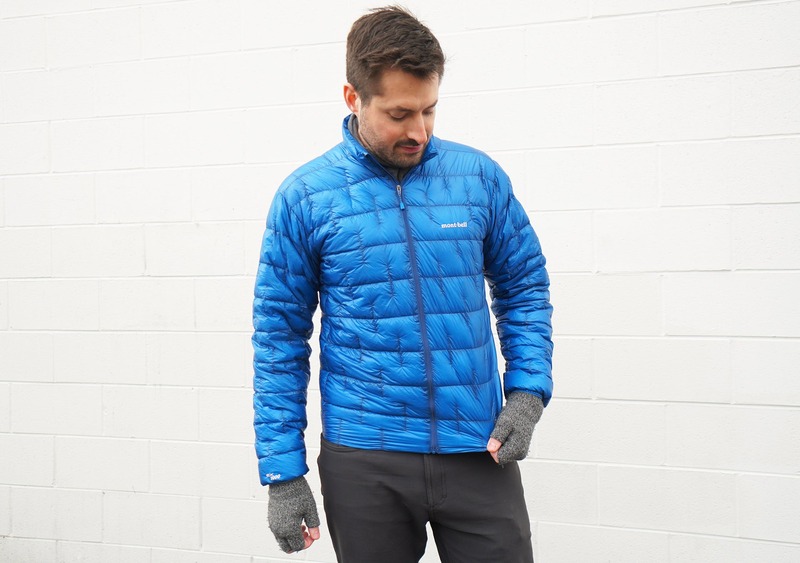 One thing we feel the need to mention is that most jackets in this ultralight down category tend to sacrifice durability for weight—so they use materials that aren’t quite as strong in order to maximize the warmth-to-weight ratio. While this jacket does have some really solid durability, it is certainly no exception to the rule. Since we typically try to travel as lightweight as possible, we generally think this is a good trade-off. Wrapped inside of that 7D nylon is 1,000 fill power goose down. “Fill power” is a measurement relating to the volume (in cubic inches) that an ounce of down will fit into. 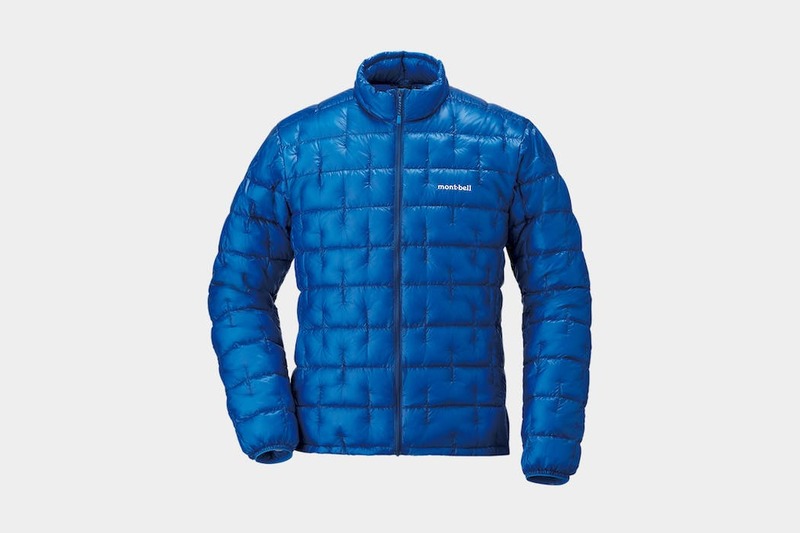 A lot of top-shelf jackets will typically use 800 to 900 fill power which is plenty, however, Montbell really pushes it with 1,000 in this jacket and the warmth to weight ratio shows. Given the durability and weight, this thing is shockingly warm. One other quick note! Montbell only utilizes down plumes and feathers “collected as a byproduct of waterfowl raised to meet the demands of the food industry.” So, they don’t source their down from any live-plucking facilities and they’re (more or less) making the best of a not-so-great situation by utilizing all of the down that would otherwise be wasted from the food industry. Long story short, they source their down as humanely as possible. That being said, we understand that some people still might not want to use goose feathers in their clothing—and we certainly don’t blame you. If that’s the case, we recommend taking a look at our reviews on the Patagonia Micro Puff and the Patagonia Nano Puff. Both of those jackets are lightweight, highly compressible, and they use synthetic down which is a very comparable fabric in terms of warmth to weight ratio without the guilt. In a general sense, this jacket kind of feels like a plastic bag—not in the “this is a crappy plastic bag” kind of way, but more in the “this thing is light as a feather and kind of crinkly” way. It’s not the most positive thing but it kind of comes with the territory when you’re talking about ultralight down jackets. The exterior is coated with DWR, which helps with additional weather resistance. However, if you do plan to wear this in inclement weather or heavier rain, we definitely recommend grabbing a rain shell that you can wear over it, as this thing isn’t meant to be a rain jacket. Prolonged exposure to rain will result in water soaking through, which can start to affect the down. That being said, if you combine this with a solid rain shell you’re going to be well prepared for a huge range of climates and weather conditions. The main zipper is a durable #3 YKK. It’s lightweight and strong, a great choice from Montbell. And lastly, there is a very unique sewing pattern on this jacket that we definitely need to touch on. Montbell has implemented as little threading as possible to keep the down in place while staying as lightweight as possible. You might not think this makes a big difference, but it actually adds up to quite a bit of thread and stitching when you’re considering the entire exterior of the jacket. In addition to saving weight, this also saves some resources over the long haul making this jacket just a tad more environmentally-friendly (although we feel like the whole down feather thing kind of negates that). The excellent warmth to weight ratio is what makes this jacket really great for extended one bag travel. After testing, we’ve found the ideal temperature range to be from about 35 to 50 degrees Fahrenheit. With the right layering strategy, we’re confident this could be your only jacket for extended one bag travel. It can get you through the coldest temperatures with a couple of simple layers underneath, and if you forgo the layers it can be used as a simple jacket on a brisk fall day without being too warm. 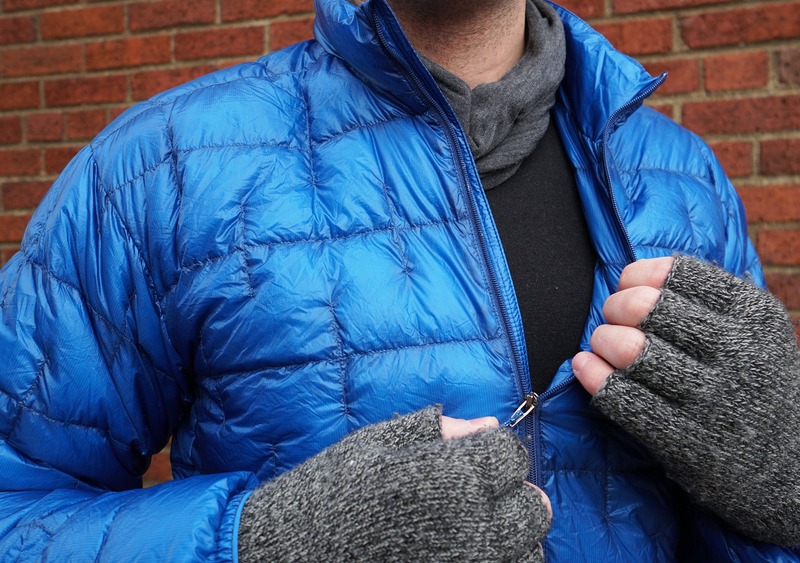 We’ve been using this throughout the Detroit winter—which is pretty darn cold, FYI—by layering appropriately. The go-to strategy has been one Wool & Prince Merino Long Sleeve Crew Neck, then the Icebreaker Long Sleeve Shifter Hoodie, then the Montbell Plasma Jacket, then the Patagonia Storm Racer for any rain or inclement weather. As far as fit goes, we have noticed this has a slightly trimmer fit than most, however, your mileage may vary. 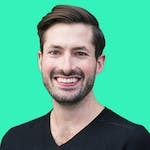 If you like to wear baggier clothes be sure to account for that in your layering strategy—you might want to go a size higher than you normally would. The end of the sleeves feature a tapered, elastic cuff to help lock warmth in and keep the sleeve in place. There is also a piece of slightly stretchy, paracord-like material that you can use to hang the jacket up on a hook. Pretty standard stuff. The jacket is compressible via the included stuff sack, however, it’s not attached to the jacket in any way. This isn’t ideal because you could easily lose it, plus it adds some additional weight. 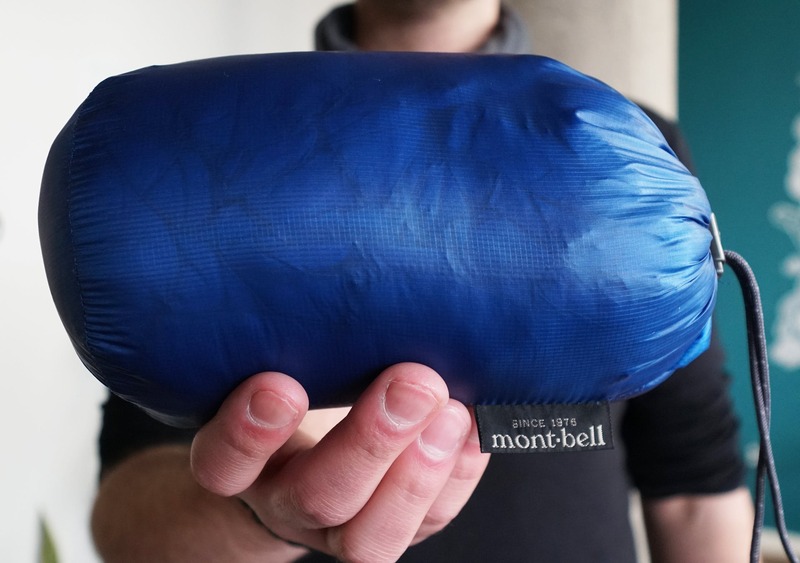 Many other jackets of this size and this compressibility will self-stuff into a pocket, so you’re probably wondering why Montbell hasn’t decided to do that. WELL, do we have a surprise for you. There are no pockets on this jacket! None at all. 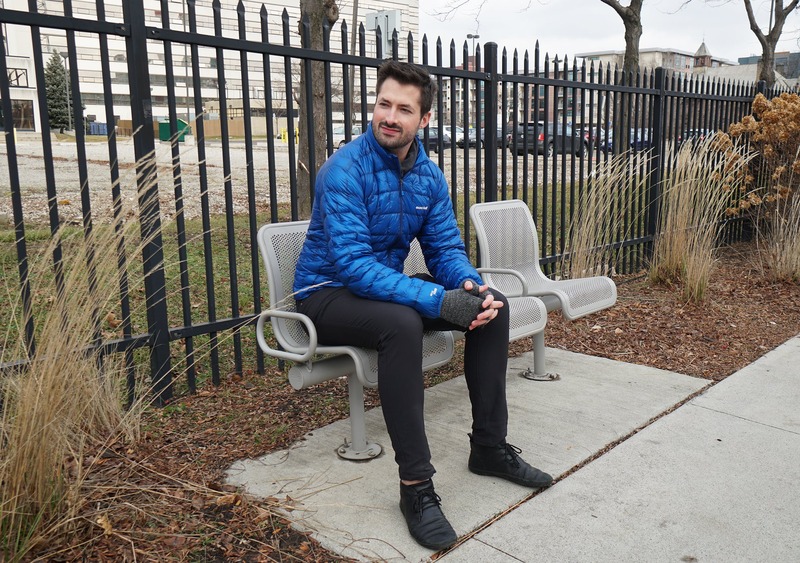 We think having pockets on a jacket is pretty nice, especially if it’s your exterior layer, but they’ve clearly made this decisions to save on weight and make this jacket as warm as possible. In addition saving weight, removing the pockets will make the jacket just a tad bit warmer as there is no room for drafts or loss of warmth. If you’re wearing this as a mid layer, the lack of pockets is not a huge deal. But yeah, we like to have pockets and we’d assume most people do as well. This is the tradeoff you get for the extreme weight savings that Montbell is going for. At the time of this review, we’ve been testing the Montbell Plasma 1000 for about two months of on and off use. 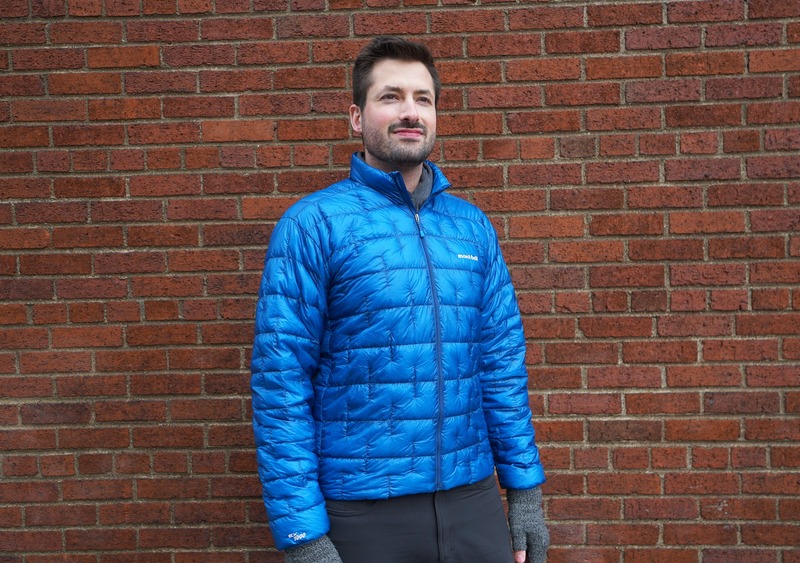 The benefits of using a jacket like this are obvious—it’s extremely lightweight, making it easy to carry around, and it still keeps you really stinkin’ warm. It’s super helpful for packing light and especially great if you have an exterior rain shell to use as well. 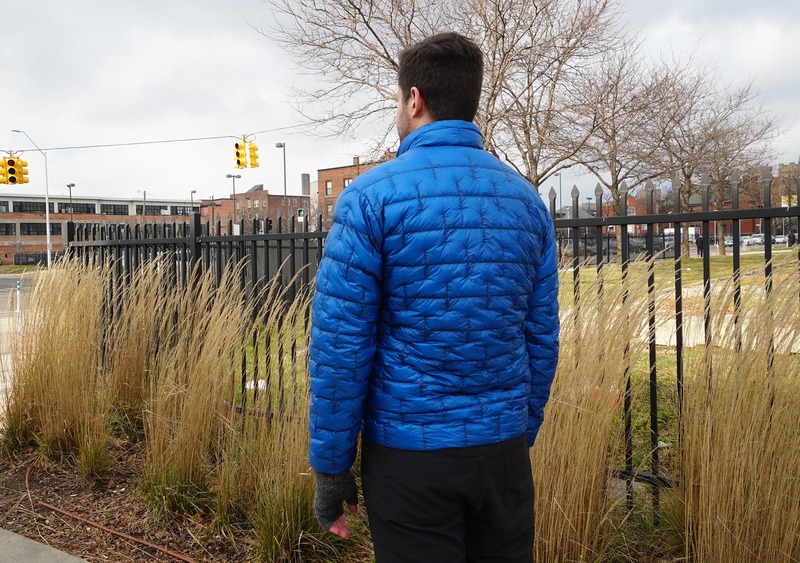 We don’t have much to report in terms of durability issues, and even with that lighter weight fabric this jacket has held up well during testing. It hasn’t gotten snagged on anything, there are no holes forming, there’s no fraying, and there’s nothing that needs to be repaired. So, we’ve been very happy with the quality so far during our testing. We should also note that, while we have yet to wash the Plasma 1000 yet, when we do we’re going to be consulting the maintenance and care guidelines on Montbell’s website. 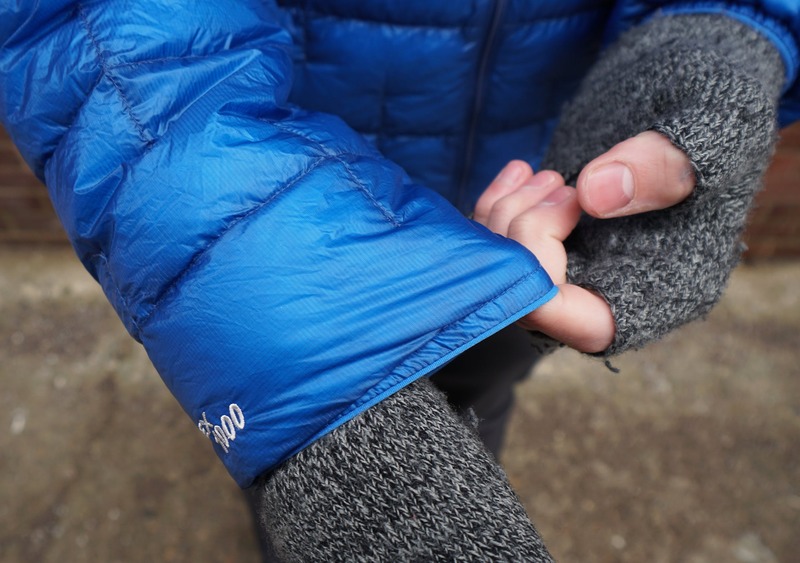 If you do find yourself needing to give your down jacket a wash, you’ll need to be very careful with how you go about it—normal detergents and cleaning methods can seriously damage your jacket! Looks great, liking the blue color. Can’t believe there are no pockets! This thing is incredibly warm considering the weight. No issues to report, working great. Still no durability concerns from on and off use. Wish the stuff sack was attached in some way. Overall, Montbell is really pushing the technology on what a jacket can do with their Plasma 1000 down jacket. It’s extremely lightweight with a good warmth to weight ratio, which is mostly what you’re looking for in a travel-oriented jacket. We are a bit disappointed in the lack of pockets and lack of self-compression, but we think the pros mainly outweigh the cons here. Sure, you can get away with a slightly heavier, less compressible, and cheaper jacket—but if you are really looking to optimize space and weight, the Plasma 1000 is an excellent choice.